Fr. 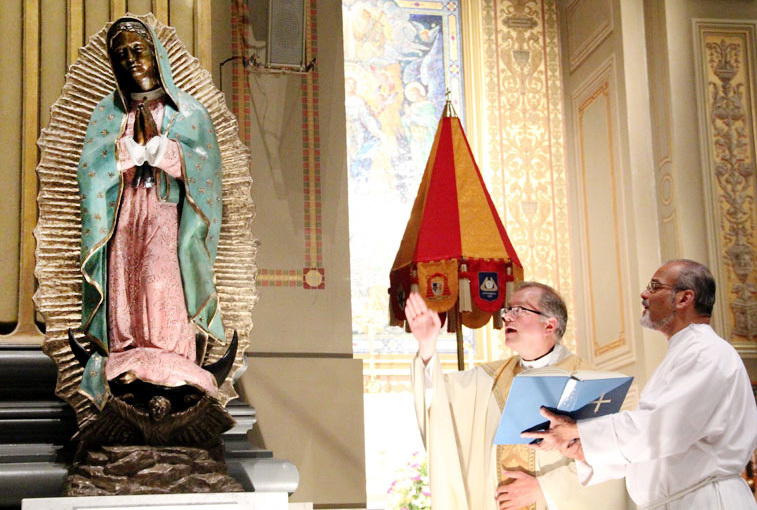 Denis Gill blesses the new bronze statue of Our Lady of Guadalupe which stands behind the altar rail in the left transept of the Cathedral Basilica of SS. Peter and Paul in Philadelphia. The colorization of the statue is not paint on bronze but rather the result of a complex process of chemical pigment and heating to attain the effect of a tinted and durable patina. 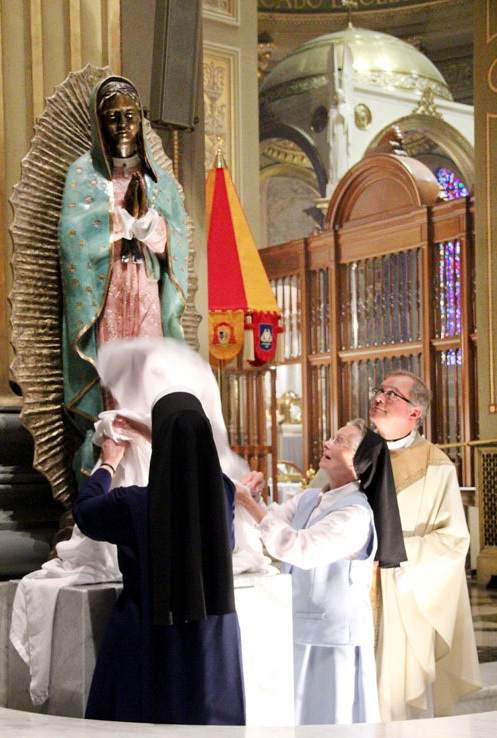 It’s been seven years in the making, but the dream of Sister Paula Beierschmitt, a Sister Servant of the Immaculate Heart of Mary, passed a milestone on May 31 when a life-sized bronze statue of Our Lady of Guadalupe was unveiled at the Cathedral Basilica of SS. Peter and Paul and blessed by Cathedral Rector Father Gerald Dennis Gill. 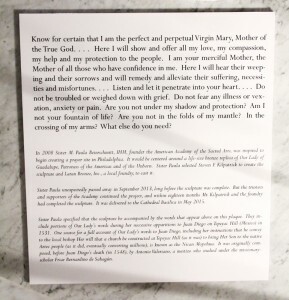 Created to Sister Paula’s specifications, the statue is scheduled to remain at the cathedral until after the World Meeting of Families and the visit by Pope Francis, after which it is expected to be relocated to a permanent site on Broad Street in South Philadelphia that was selected by her. Sadly, Sister Paula, a talented artist in her own right and founder of the American Academy of Sacred Arts in South Philadelphia, was not physically present to savor the moment. She died suddenly in September 2013, but her presence was alive in friends and family, both secular and religious, at the cathedral for the unveiling. For many if not most of those who attended the ceremony, it was as much a tribute to Sister Paula as it was the dedication of a work of art. The story began in 2008 when Sister Paula, while on a retreat in Emmitsburg, Md., using an old film camera, snapped a picture of a mosaic in a shrine to the Blessed Mother. For reasons neither she nor any of the experts she consulted could explain, when the film was developed the image of Our Lady, but not the area around it, was encircled by a luminescence that had not been visible to Sister Paula or her companions that day. 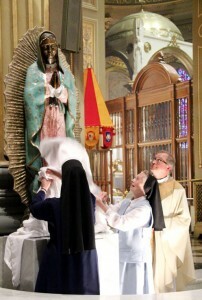 After praying on the matter she became convinced the Blessed Mother wished her to promote the devotion to Our Lady of Guadalupe through the placement of her statue in a prominent location. Where this would be she didn’t know until Pentecost 2010. Upon returning to her convent from Mass, she noticed a façade by the Carto Funeral Home on South Broad Street (see a map) and intuitively sensed that was where Mary wished her statue to be. Sister Paula, who was never known for shyness, entered the funeral home and told the owner and director, Nunzio Carto, of what she was convinced was Our Lady’s wish. He readily agreed to permit a statue to be installed. Immaculate Heart Sisters Mary St. Mark and Sister Susan Scattergood, both good friends in Sister Paula’s convent life, unveil the statue. 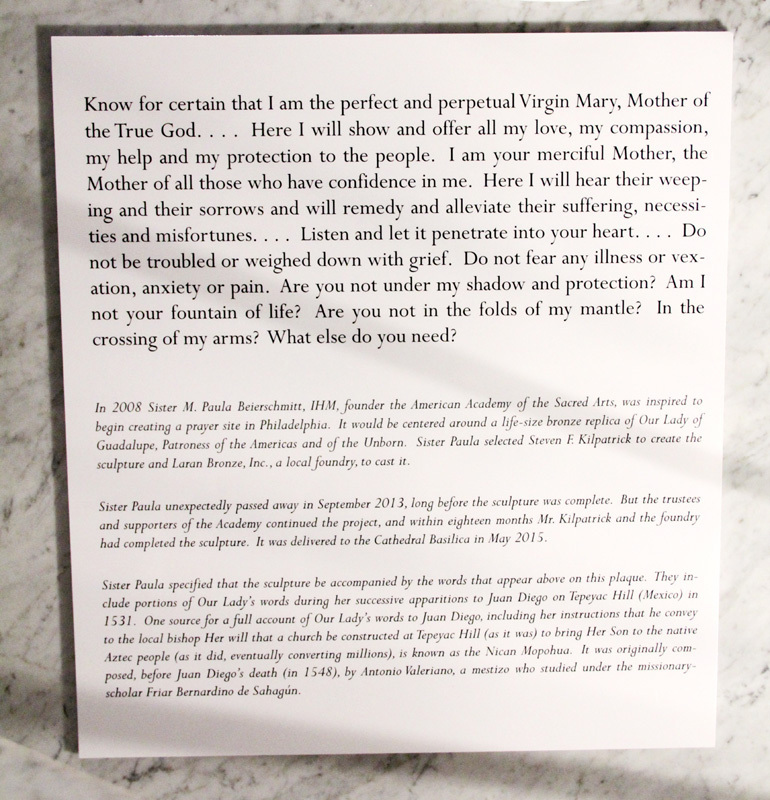 Such a statue cast in bronze would not come cheaply, and working through her supporters at the American Academy of Sacred Arts, Sister Paula began raising the money. She also selected sculptor Steven Kilpatrick, a New Jersey artist with an international reputation for creating artwork with both sacred and secular themes. With Sister Paula’s death the project, which was budgeted at $200,000 but has surpassed that, could have come to an end except for the support her many friends. One of them was Bill Maffucci, a lawyer who has succeeded her as interim president of the American Academy. “I think Sister Paula must be very pleased. Everything is falling into place,” Maffucci said. In the planning stages for the statue Kilpatrick obtained authenticated specifications of the image that appeared on the tilma (cloak) of St. Juan Diego on Tepeyac Hill near Mexico City in 1531. The process of crafting the statue was complex. Although it is of bronze and the features of Our Lady are of bronze shade, her raiment is in the same brilliant colors as they appear on the tilma and traditional copies of it. This was achieved, Kilpatrick explained, by heating areas of the statue and applying chemical pigments to the bronze, which after reheating and cooling became a patina that will remain for many years, providing routine waxing is done as needed. Performing the actual unveiling of the statue were Immaculate Heart Sister Mary St. Mark and Sister Susan Scattergood, both good friends in Sister Paula’s convent life, while her birth sisters Paula Beierschmitt Luskus and Gina Beierschmitt were among the relatives attending. 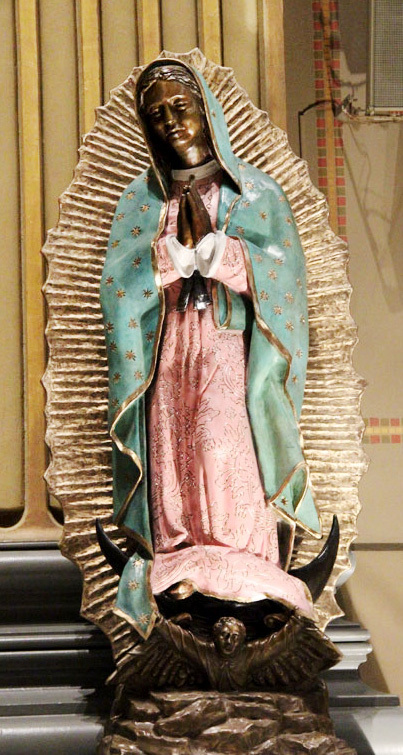 The statue is supported on a marble pedestal that includes a devotional prayer to the Blessed Virgin Mary under the title of Our Lady of Guadalupe. But of course many, many other people were involved in helping Sister Paula’s dream come true and a number were at the unveiling. One of them was local businessman Jim White, whose company did all of the transportation work free of charge.